Some Windows 10 PCs, including Microsoft’s Surface Laptop, come with “Windows 10 in S Mode.” PCs in S Mode can only install applications from the Microsoft Store. But you’re free to leave S Mode, if you like. Windows 10 in S Mode is a more limited, locked-down Windows operating system. In S Mode, you can only install apps from the Store, and you can only browse the web with Microsoft Edge. Microsoft is pitching security, speed, and stability here. Because Windows can only run apps from the Store, malware from the web won’t be able to run. You can’t install applications from the web, so they can’t install startup tasks that slow down your boot process or junkware that hides in the background and spies on you. S Mode also pushes the Bing search engine. While in S Mode, the Microsoft Edge web browser uses Bing as its default search engine. You can’t change Edge’s default search engine to Google or anything else without leaving S Mode first. If all the applications you want to run are available in the Microsoft Store, S Mode is a more secure experience. That’s why Microsoft initially pitched S Mode for schools. 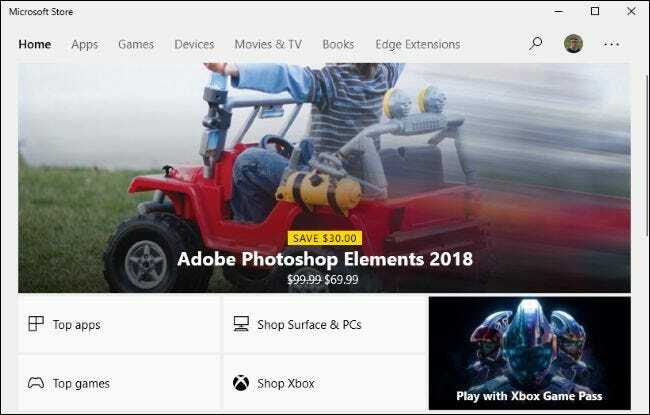 You can run Microsoft Edge, Microsoft Office, and anything else available in the Store, including apps like Apple iTunes and Spotify. It’s a bit like Apple’s iOS operating system on an iPhone or iPad, which only allows you to install apps from the App Store. But S Mode limits you to the Windows apps available in the Microsoft Store. Windows 10’s S Mode is optional. Most Windows 10 PCs come with standard Windows 10 Home or Windows 10 Professional operating systems that let you run software from everywhere. PCs that ship with S Mode will say they use “Windows 10 Home in S Mode” or “Windows 10 Professional in S Mode” in their product specifications. Even if you purchase a PC in S Mode, you can leave S Mode for free. It doesn’t cost anything, but it is a one-time decision—once you’ve taken the PC out of S Mode, you can never put it back into S Mode. We don’t know why Microsoft makes this a one-way process. But that’s what Microsoft did. You can check whether you’re using S Mode by heading to Settings > System > About. On the About page, scroll down to the “Windows Specifications” section. If you see the words “in S mode” to the right the Edition entry, you’re using an S Mode PC. If you don’t, you’re not using S Mode. Should I Buy a PC With S Mode? Because it’s easy and free to leave S Mode, there’s no downside to buying a Windows 10 PC that comes with S Mode. Even if you don’t want S Mode, you can easily switch out of it. For example, Microsoft only sells the Surface Laptop in S Mode. But that’s fine—even if you want a Surface Laptop that runs a standard Windows operating system, you can just buy it and take it out of S Mode for free. Should I Use the PC in S Mode? S Mode sounds limited, and that’s the point. If you only need a basic Microsoft Edge web browser, Microsoft Office applications like Word, and anything else that’s available in the Microsoft Store, you should try using the PC in S Mode. The S Mode restrictions provide additional protection against malware. PCs running in S Mode can also be ideal for young students, business PCs that only need a few applications, and less experienced computer users. Of course, if you need software that isn’t available in the Store, you have to leave S Mode. But you can try using the PC in S Mode for a while and see how well it works for you. You can leave S Mode at any point. Remember: While you can leave S Mode whenever you like, your choice to leave S Mode is a permanent decision. Once you’ve left S Mode, you can never put the PC back into S Mode. It will use a standard Windows 10 Home or Windows 10 Professional operating system. 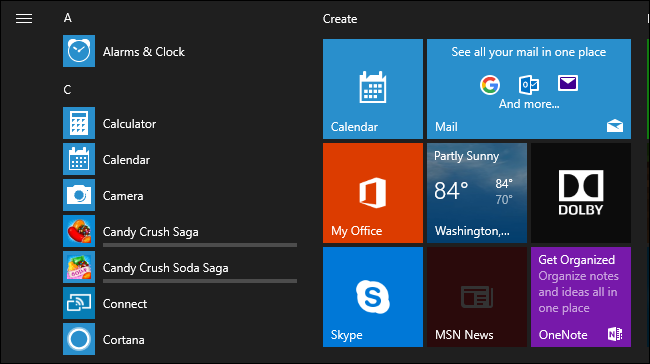 However, you can choose to allow apps only from the Store on any Windows 10 PC. 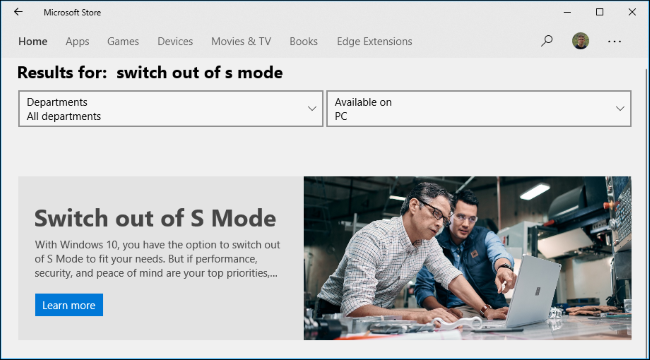 To leave S Mode, open the Store app on your PC and search for “Switch out of S Mode.” The Store will guide you through taking your PC out of S Mode. How is S Mode Different From Windows 10 S? Most editions of Windows 10 can be placed into S Mode. You can buy PCs with either Windows 10 Home in S Mode or Windows 10 Professional in S Mode, and organizations can use Windows 10 Enterprise in S Mode. However, only a PC’s manufacturer can place it into S Mode. Most Windows 10 PCs don’t ship in S Mode. Microsoft also lets you leave Windows 10 S Mode without spending any additional money. So, if you need software that isn’t available in the Microsoft Store, you can get it without spending any money. Microsoft planned a $50 fee to leave Windows 10 S.
Any existing PCs with Windows 10 S will be converted to Windows 10 Professional in S Mode when they install the April 2018 Update. What About Windows 10 on ARM? Microsoft is now shipping Windows 10 PCs that use ARM processors. These computers have an emulation layer that allows them to run traditional 32-bit Windows software. While these ARM PCs may ship in S Mode, you can also choose to leave S Mode for free on these PCs. That will let you install 32-bit desktop applications from everywhere, although many demanding applications and games don’t perform well in the emulation layer. Many S Mode PCs, like Microsoft’s own Surface Laptop, have Intel processors. A PC with any type of hardware can be configured in S Mode, and Windows 10 on ARM PCs don’t have to use S Mode.